Six unclued lights are of a kind. 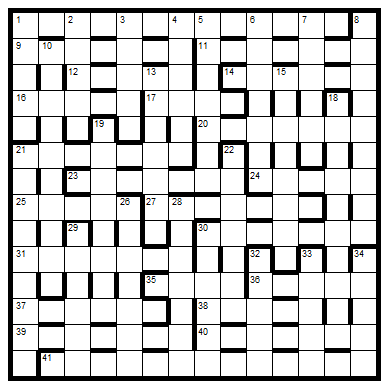 The 1 across will be able to solve them with the help of a defining sentence (18 words) hidden as extra words in some across clues. Chambers is the primary reference apart from 10d which appears as a definition of an associated word in OED. To enter this competition, send your entry as an image or in list format, to derekharrison@yahoo.com before the 8th March 2015. The first correct entry drawn from the hat will receive a book from the Chambers range which has been donated by Chambers.